Tác giả của bản hack này là Redriders180 hay còn được gọi là Lucbui. Tới nay anh đã tạo các bản hack ROM được hơn 5 năm và Pokémon Glazed là bản hack được tác giả đầu tư nhiều nhất về cả thời gian và tâm huyết. Hôm nay là ngày bạn được 12 tuổi và cũng là ngày được nhận Pokémon đầu tiên của mình. Nếu như bạn nghĩ rằng mình sẽ có một cuộc phiêu lưu nhàm chán tại vùng đất Tunod thì bạn đã sai hoàn toàn. Một sức mạnh bí ẩn đang khiến cho thế giới Pokémon và thế giới thật hòa lại làm một. Một nhóm người bí ẩn lùng sục tại các khu di tích cổ của Tunod với một mục đích xấu xa. Cùng đồng hành với 3 người huấn luyện đến từ vùng đất Johto, và một chú Pikachu quấn khăn đang có kế hoạch trả thù. Liệu bạn có thể đối đầu với các thế lực kia và trả lại sự bình yên cho hai thế giới? Sonic1 - My AMAZING ASM teacher, as well as just a good friend. Articuno/Zapdos/Moltres - They reside on the snowiest, stormiest, and hottest islands of Rankor, but will only come with you if you provide them with an item. Mew - Now that Mew is calmed down, maybe it will feel bad about its rage and destruction? Entei/Raikou/Suicune - The three Pokemon are in debt to Ho-oh, so maybe they will want to pay their respects to it. 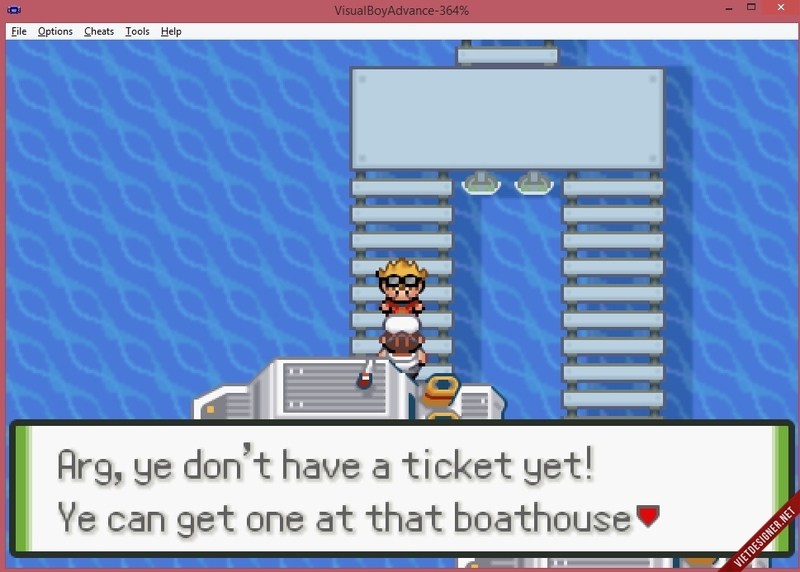 But only if you can get word of their arrival in Johto. Lugia - The Whirl Islands may have sunk, but perhaps an amicable sailor will take you there. Groudon/Kyogre/Rayquaza - They may appear where the land, sea, and sky are connected. Maybe they will appear to one with their respective jewels? Latias/Latios - They're oft inclined to roam around, don't you think? Jirachi - Nobody likes to do work when you're at an island resort. If you do some, maybe you'll get a reward. Uxie/Azelf/Mesprit - Go to where it all began, and investigate anything strange. Dialga/Palkia/Giratina - The top floor of the Fusion Resort might yield something useful. Cresselia - Why's that man sleeping next to the pond? And why does the owner of the Azure Inn charge so much for rooms? Darkrai - Who is the only person you know with a Darkrai? Regigigas - When the three pillars are removed, the master will awaken. Manaphy - It might seem like a lame first prize for such a tricky race, but maybe it has a bigger purpose. Arceus - When you have encountered every Legendary, Arceus will reveal himself to you. Victini - A reward for retracing your steps in Tunod, and exploring previously inaccessible areas. Cobalion/Terrakion/Virizion - Where's a likely place to find Fighting Types? Reshiram - Where is the fieriest place in Tunod? Kyurem - Where is the coldest place in Tunod? Articuno/Zapdos/Moltres - Upon encountering the Tao Trio, each will reveal a certain feather. These feathers will enable you to battle Articuno, Zapdos, and Moltres, upon being taken to their island and shown to them. Mewtwo - After defeating seven Gym Leaders in Johto, a Dragonite will approach you on Route 44, providing information on how to get to New Island, where Mewtwo can be found. Mew - Once you beat the Elite Four of Tunod, return the top floor of Fusion Labs. You will find Mew there. Having an empty space in your party will allow Mew to join your team. Entei/Raikou/Suicune - After Regina captures Ho-Oh, travel to the top of the Brass Tower. Eusine will be there, and after some dialog, will leave. Either Entei, Raikou, or Suicune will be at the top of the Bell Tower next time you travel up it, and a random one will appear every time you climb the tower. Lugia - Upon Lugia being released by Pius, a sailor will appear on Route 40, looking for someone with Dive. He will take you to the location of the sunken Whirl Islands, where Lugia will appear. Ho-oh - After freeing Ho-Oh from Regina, it will appear on the Brass Tower's roof. Celebi - After defeating the Johto Elite Four, you will find the Ilex Forest green and thriving once more. Interacting with the Ilex Shrine will cause Celebi to appear. Ruins Of Alph Subquest - In one of the four ruins in the Ruins of Alph, you will enter a chamber that is somewhat different than the other three. Starting from the top of the room, travel counterclockwise around the room. A cave will open. Pressing the switch will activate the Weather Trio events. Groudon - Unfortunately, the hardest one to get. After completing the Lance sidequest (See Heatran), Travel back to Mt. Silver from the Goldenrod Train Station. Battle Red, and if you defeat him, you will be given a Ruby. Take this to the first-floor chamber at the Embedded Tower to battle Groudon. Kyogre - After completing the Ruins of Alph subquest, go to the basement of Slowpoke Well. Interacting with the tablet will cause you to fall to a lower floor, where a Sapphire will be found. Take this to the bottom level of the Embedded Tower to battle Kyogre. Rayquaza - After completing the Ruins of Alph subquest, go into the Dragons Den. Interacting with the tablet will cause you to fall to a lower floor, where an Emerald can be found. Take this to the top level of the Embedded Tower to battle Rayquaza. Latios/Latias - After beating the Elite Four of Tunod, they will begin to wander the Tunod region. They will change location daily, and won't disappear if you knock them out. Talking to Lars, the man inside of the Legendary Pokemon Research Lab outside of Violet City will give you a clue to their location. Jirachi - A snobby girl in one of the rooms at Fusion Resort will make you run many errands for her. 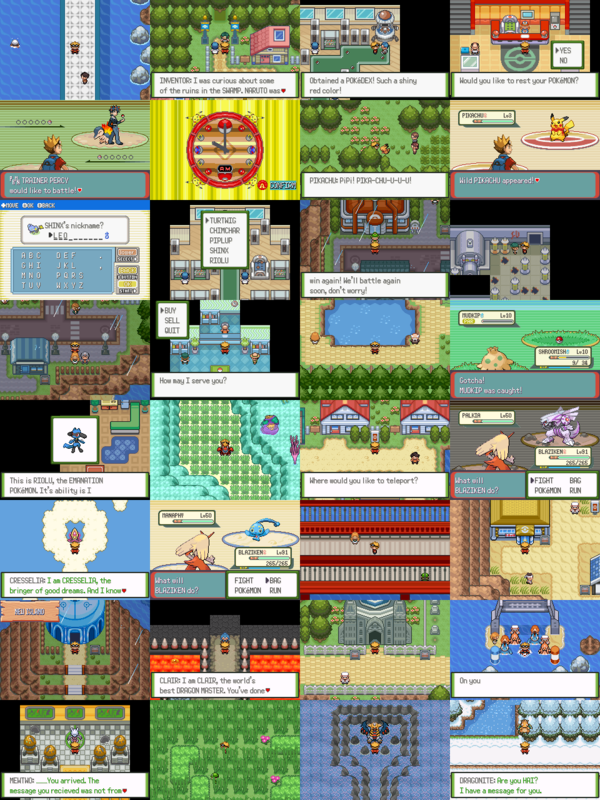 Completing them all will give you a Wish Ticket, which can be taken to the right-most sailor in Oceanview City for a trip to Wish Island, where Jirachi will await the player. Uxie/Azelf/Mesprit - At the uppermost peak of the Peaks of Alpha, a white stone stands. Interacting will let you visit one of three islands, each with a Legendary Pixie at them. Penthouse Sidequest - Since this is needed for three Legendaries, I'm placing it on its own bullet point. After defeating Team Fusion at the Ruins of Alph, a drudge will have left behind a Penthouse Key. Bringing this to Fusion Resort on Serenity Isle, you can access the top floor via the elevator. Obtain the Adamant, Lustrous, and Griseous orbs there. Dialga - After completing the Penthouse Sidequest, travel east of Chocco Town. When you get close to the correct spot, the Adamant Cave will open up, where you can battle Dialga. Palkia - After completing the Penthouse Sidequest, travel to Spatial Sea. When you get close to the correct spot, the Lustrous Cave will open up, where you can battle Palkia. Giratina - After completing the Penthouse Sidequest, travel to Haunted Seaway. When you get close to the correct spot, the Griseous Cave will open up, where you can battle Giratina. Cresselia - Use Roar on the sleeping man outside of Violet City, on Route 31. Defeating him in a battle will net you a Lunar Wing. Bring this Lunar Wing to the Azure Inn, and the Innkeeper will give you a free room in return for it. Sleeping in this bed will bring you to the Dreamspace, where Cresselia can be fought. Darkrai - After completing the Cresselia event, visit the VIP Villa in Palmtree Resort. Blake's Darkrai will take you to the Dreamspace. After a monologue, it will give you an egg containing a Darkrai. NOTE: If you don't have a free space in your party, this egg will be sent to the PC. Regigigas - After defeating, fleeing from, or capturing the other Regis, approaching the central cave will cause it to open. Inside, you will find Regigigas. Heatran - After defeating the Johto Elite Four, travel to the peak of the Johto Victory Road. Lance will be standing at the tip of the mountain. Talk to him to initiate the Lance sidequest, and follow his instructions. Manaphy - Enter a surfing race in Evergreen Town. Getting first place will net you a Sea Jewel. Manaphy will then appear at the Spatial Sea. Arceus - Encounter every Legendary, and he will allow you to his cloud temple at the very peak of Mt. Stratus. The randomly-encountered ones (Latias, Latios, Raikou, Entei, Suicune) are not required. Victini - Continue west of Seaspray Town to Soheal's Strait. Continue to Soheal's House, and defeat him in battle. The prize will be a Victini. Cobalion/Terrakion/Virizion - After they have shown themselves to you, a cave will be opened in the Darkwood Grotto. Upon entering, the three will begin to battle you. Reshiram - After defeating the Tunod E4, The back area of Mt. Furnace becomes accessible. Reshiram can be found here. Zekrom - After defeating the Tunod E4, The roof of the Oceanview Power Plant becomes accessible. Zekrom can be found here. Kyurem - After defeating the Tunod E4, a secret area of Icicle Tunnel becomes accessible. Kyurem can be found here. Taking Kyurem to the Blackwhite Ruins inside of Mt. Mortar will allow you to change it's form to White or Black Kyurem. Note that this is not a perfect forme change; All that is preserved is level. Moves taught to it will be lost, EVs will be reset, and IVs will be randomized. Cai nay choi bang gia lap gi vay? Hình như hack từ ROM Emerald nên sẽ chơi bằng GBA. Tăng tốc frame skip 9 Throtte 1000% mà nó chạy có 200% chậm kinh có cách nào tăng tốc ko anh? Nên chơi bằng VBA vì giả lập này ổn định, ko bị lỗi nhiều như các giả lập khác. Đơn giản như lỗi vào Mart mua đồ hiện ra Item ????? cho mình hỏi, mình mới trade ninetail lấy politoed, thì thấy politoed k nghe chủ, có phải do thiếu badge k?? Có hướng dẫn ko anh? Cho em xin với đi! Throtte thì để No Throtte ấy . Cái này có hướng dẫn hem bà con! Cho mình hỏi, mình mở game bằng VBALink nhưng chỉ hiện màn hình trắng thôi, có thể khắc phục không ạ? Bạn phải patch cái bản này vào bản Pokemon Emerald nguyên bản thì cái bản Emerald kia mới thành bản update ( bản Glazed) thì mới chơi được,chứ các bạn chỉ down về rùi chơi thì không được đâu,mình vá bằng phần mềm NUPS rùi chơi bình thường rùi,chúc các bạn thành công.